If you’re looking for a quick, easy and delicious meal to whip up for breakfast, look no further than these broccoli and cheese mini omelettes! Breakfast is easily the most important meal of the day — it gives you the fuel you and your family need to succeed. Are you and your kids tired of eating cold cereal or toast for breakfast during the weekday? Our broccoli omelette bites are a great solution. Make them ahead of time and reheat them when you need them. Throw them in the microwave before you and your family heads out the door and voila — you have a tasty breakfast in minutes! This recipe is great for the weekends, too. Double or even triple the recipe if you’re feeding a crowd. Going to a brunch potluck? They’re perfect! Are the kids having a sleepover with a few of their friends? No problem! Whatever the occasion or the day, these mini omelette bites conveniently come together fast. This recipe will also make a healthy meal. The protein in the eggs will give you and your family a boost, and sneaking veggies into your cooking whenever you can is always a good thing. You and your family won’t even be thinking about how healthy they are because they’re so tasty! 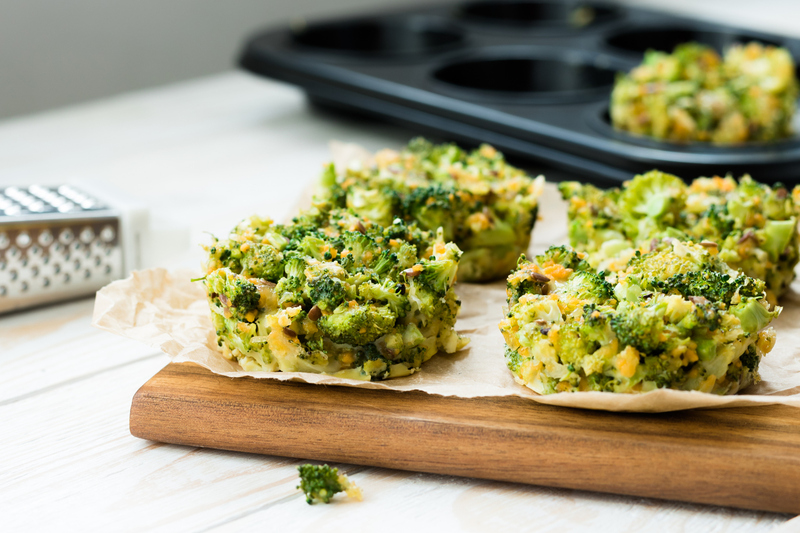 Check out our recipe for broccoli and cheese omelette bites to make for breakfast soon! Cook your broccoli. Once it is tender, toss it with the olive oil and season it with some salt and black pepper. Beat the eggs in a medium bowl. Once the yolks and whites are fully blended, add the salt, black pepper, and onion powder. Whisk more. Take a cupcake pan and spray generously with cooking spray. Evenly distribute the broccoli amongst the cups in the pan. Pour the beaten eggs over the broccoli. The cups should be about 3/4 full. Top each cup with both types of shredded cheese. Bake the omelette cups for about 20 to 25 minutes or until fully cooked. Serve immediately. If you have any leftovers, wrap them in plastic wrap or seal in a resealable plastic baggie. As you’re preparing these cheesy broccoli omelette bites, make sure you use Sauder’s eggs. When you’re cooking delicious meals for yourself and your family, you want to use the best ingredients. At Sauder’s, we are dedicated to providing eggs of the highest quality and freshness. To achieve our mission, we partner with a network of farmers who agree quality is the most important thing. To find delicious Sauder’s eggs at your nearest retailer, be sure to use our store locator today.